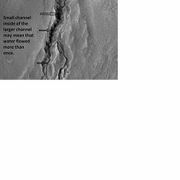 Martian gullies are narrow channels and their associated downslope sediment deposits, they are found on steep slopes on Mars. They were first discovered on Mars Global Surveyor images especially on the walls of craters. Usually, each gully has a ‘‘alcove’’ at its head, a fan-shaped apron at its base, and a single thread of incised channel connecting the two. The whole gully resembles an hourglass. They are estimated to be relatively young because they have few, if any, craters. Most gullies appear 30 degrees poleward in each hemisphere, with greater numbers in the southern hemisphere. Some studies have found that gullies occur on slopes that face all directions. On the basis of their form, aspects, positions, and location amongst and apparent interaction with features thought to be rich in water ice, many researchers think (especially when they were first discovered) that the processes carving gullies involve liquid water. Because the gullies are so young, this would suggest that liquid water has been present on Mars in its very recent geological past, consequently adding to the possibility of living forms on the present surface. After being discovered, many hypotheses were put forward to explain the gullies. However, as in the usual progression of science, some ideas came to be more plausible than others when more observations were made, when other instruments were used, and when statistical analysis was employed. Even though some gullies resembled debris flows on Earth, it was found that many gullies were on slopes that were not steep enough for typical debris flows. Although it was suggested that liquid carbon dioxide could cause gullies, calculations showed that the pressure and temperatures were not suitable for liquid carbon dioxide. Moreover, the winding shape of the gullies suggested that the flows were slower than what would be produced in debris flows or eruptions of liquid carbon dioxide. Liquid carbon dioxide would explode out of the ground in the thin Martian atmosphere. Because the liquid carbon dioxide would throw material over 100 meters, the channels should be discontinuous, but they are not. Eventually, most hypotheses focused on liquid water coming from an aquifer, from melting at the base of old glaciers (or snowpacks), or from the melting of ice in the ground when the climate was warmer. Close-up images with HiRISE showed details that support the idea that a fluid was involved. Images show that channels formed at various times--smaller channels were found in larger valleys, suggesting that after a valley formed another formed at a later time. Many cases showed channels took different paths at different times. Streamlined forms like teardrop-shaped islands were common in some channels. On the Earth, running water is the cause of streamlined forms. Smaller gullies inside larger ones Water may have flowed in these gullies more than once. Close-up of gullies in crater showing channels within larger valleys and curves in channels. These characteristics suggest they were made by flowing water. Location is Eridania quadrangle. The following group of pictures of gullies illustrates some of the shapes that lead researchers to think that water was involved in creating at least some of the gullies. Gullies The location is the Phaethontis quadrangle. Gullies, as seen by HiRISE Location is the Phaethontis quadrangle. Close-up of gully channels, as seen by HiRISE under HiWish program. This image shows many streamlined forms and some benches along a channel. These features suggest formation by running water. Benches are usually formed when the water level goes down a bit and stays at that level for a time. Location is the Mare Acidalium quadrangle. Gullies on dunes Some gullies on sand dunes appear each Martian year. It is difficult to conceive of an aquifer causing gullies on dunes. Aquifers need a wide collecting area which is not present on sand dunes or on isolated slopes. Even though most of the original gullies that were seen seemed to come from the same layer in the slope, some exceptions to this pattern have been found. 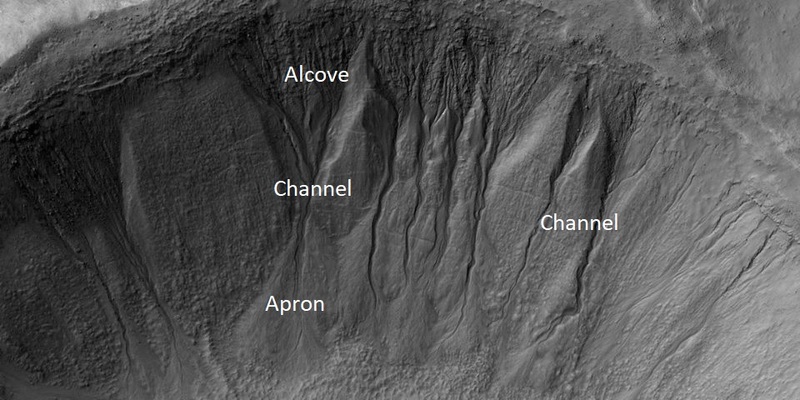 Examples of gullies coming from different levels are shown below in the image of Lohse Crater and the image of gullies in Ross Crater. CTX image of the next image showing a wide view of the area. Since the hill is isolated it would be difficult for an aquifer to develop. Rectangle shows the approximate location of the next image. Gully on mound as seen by Mars Global Surveyor, under the MOC Public Targeting Program. Images of gullies on isolated peaks, like this one, are difficult to explain with the theory of water coming from aquifers because aquifers need large collecting areas. Gullies on 2 sides of a mound. This arrangement is difficult to explain with aquifers. Gullies in two levels of a crater wall, as seen by HiRISE under HiWish program. Gullies at two levels suggest they were not made with an aquifer, as was first suggested. Location is Phaethontis quadrangle. The main basis for the snowpack hypothesis for gully formation is that much of the surface of Mars is covered by a thick smooth mantle that is thought to be a mixture of ice and dust. This ice-rich mantle, a few yards thick, soothes the land. The mantle may be like a glacier, and under certain conditions the ice that is mixed in the mantle could melt and flow down the slopes and make gullies. Indeed, calculations show that a third of a mm of runoff can be produced through the melting of a dusty snowpack each day for 50 days of each Martian year even under current conditions. Because there are few craters on this mantle, the mantle is relatively young. An excellent view of this mantle is shown below in the picture of the Ptolemaeus Crater Rim, as seen by HiRISE. The ice-rich mantle may be the result of climate changes. Changes in Mars's orbit and tilt cause significant changes in the distribution of water ice from polar regions down to latitudes equivalent to Texas. During certain climate periods water vapor leaves polar ice and enters the atmosphere. The water comes back to ground at lower latitudes as deposits of frost or snow mixed with dust. This movement of water could last for several thousand years and create a snow layer of up to around 10 meters thick. When ice at the top of the mantling layer goes back into the atmosphere, it leaves behind dust, which insulates the remaining ice. When the slopes, orientations, and elevations of thousands of gullies were compared, clear patterns emerged from the data. Measurements of altitudes and slopes of gullies support the idea that snowpacks or glaciers are associated with gullies. Steeper slopes have more shade which would preserve snow. Higher elevations have far fewer gullies because ice would tend to sublimate more in the thin air of the higher altitude. For example, Thaumasia quadrangle is heavily cratered with many steep slopes. It is in the right latitude range, but its altitude is so high that there is not enough pressure to keep ice from sublimating (going directly from a solid to a gas); hence it does not have gullies. In summary, it is now estimated that during periods of high obliquity, the ice caps will melt causing higher temperature, pressure, and moisture. The moisture will then accumulate as snow in midlatitudes, especially in the more shaded area. At a certain time of the year, sunlight will melt snow with the resulting water producing gullies. ↑ Dickson, J; Head, J; Kreslavsky, M (2007). "Martian gullies in the southern mid-latitudes of Mars: Evidence for climate-controlled formation of young fluvial features based upon local and global topography" (PDF). Icarus. 188: 315–323. ↑ name="2007Icar..188..324H">last1=Heldmann|first1=J|last2=Carlsson|first2=E|last3=Johansson|first3=H|last4=Mellon|first4=M|last5=Toon|first5=O|title=Observations of martian gullies and constraints on potential formation mechanisms. The northern hemisphere|journal=Icarus|volume=188|pages=324–344|date=2007|doi=10.1016/j.icarus.2006. ↑ Heldmann, J; Carlsson, E; Johansson, H; Mellon, M; Toon, O (2007). 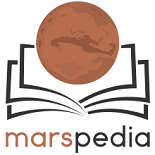 "Observations of martian gullies and constraints on potential formation mechanismsII. The northern hemisphere". Icarus. 188: 324–344. ↑ Heldmann, J (2004). "Observations of martian gullies and constraints on potential formation mechanisms". Icarus. 168: 285–304. ↑ Forget, F. et al. 2006. Planet Mars Story of Another World. Praxis Publishing. Chichester, UK. ↑ Head, J., D. Marchant, M. Kreslavsky. 2008. Formation of gullies on Mars: Link to recent climate history and insolation microenvironments implicate surface water flow origin. PNAS: 105 (36), 13258–13263. ↑ Head, JW; Marchant, DR; Kreslavsky, MA (2008). "Formation of gullies on Mars: Link to recent climate history and insolation microenvironments implicate surface water flow origin". PNAS. 105 (36): 13258–63. ↑ Dundas, C. et al. 2016. HOW WET IS RECENT MARS? INSIGHTS FROM GULLIES AND RSL. 47th Lunar and Planetary Science Conference (2016) 2327.pdf. ↑ Vincendon, M. 2015. JGR:120, 1859–1879. ↑ Dundas, C., S. Diniega, C. Hansen, S. Byrne, A. McEwen. 2012. Seasonal activity and morphological changes in martian gullies. Icarus, 220. 124–143. ↑ Schorghofer, N., K. Edgett. 2005. Seasonal surface frost at low latitudes on Mars. Icarus: 180, 321-334.